Trail mix is easy to buy at the store. Unless we want trail mix that all three of us will eat. Lee can’t eat dairy. I am allergic to apricots. I don’t care for peanuts much, and Boo doesn’t like nuts at all. So we mix our own. It’s a complicated process of going to the store, buying a bag of everything we like, and dumping it together. Each bath we try a new protein thing in hopes Boo will like it (and knowing that kids’ tastes change as they get older and get more molars). 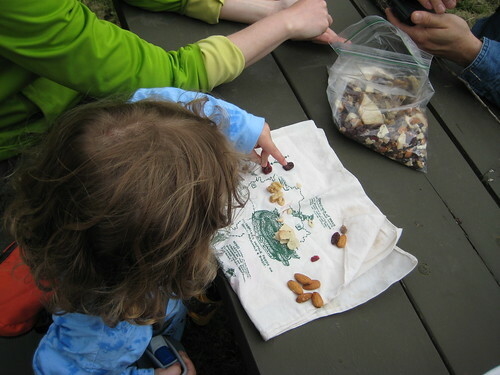 We try to keep approximately even amounts of nuts/seeds and dried fruit. For sweet, we put in dairy-free chocolate chips. These make a sticky mess if it’s going to be warm or sunny. We have pondered vegan M&M-type candies for less mess when it’s warmer, but haven’t gotten around to actually trying them. Dried Fruit: raisins, craisins, blueberries, apples, strawberries, cherries. Nuts and Seeds: walnuts, pecans, cashews, sunflowers, almonds, pine nuts, pumpkin seeds. We will sometimes throw in pita chips or whatever crunchy chip/cracker thing catches our interest. What do you like in trail mix? What don't you eat?